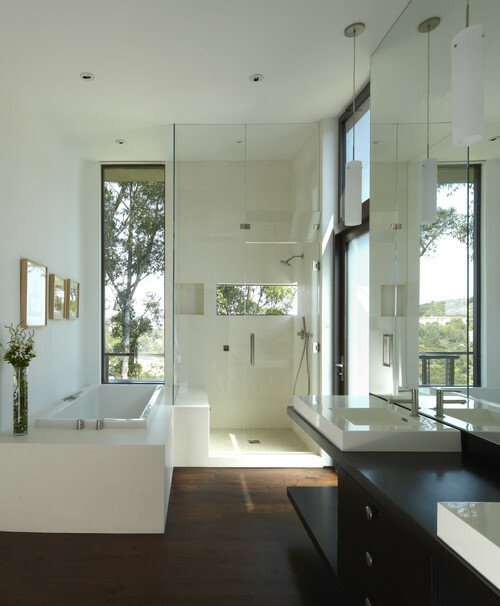 If you find yourself daydreaming about a perfect bathroom, you’re not alone. The good news is that you don’t have to spend a fortune to achieve a high-end, luxurious look. Read on for eight easy updates for a spa-like bathroom that will please homeowners and buyers alike. Many trending bathroom photos have chandeliers hung above the bathtub, which are glamorous, but often expensive. You don’t need to spend an arm and leg to have a beautiful bathroom when a set of pretty pendants can do the trick. Pendant lights come in just about every style and price point, so you’ll have a wide selection to choose from. Tip: Pendants are most functional when hung at eye-level in the bathroom. Like lighting, mirrors also come in a wide price range. 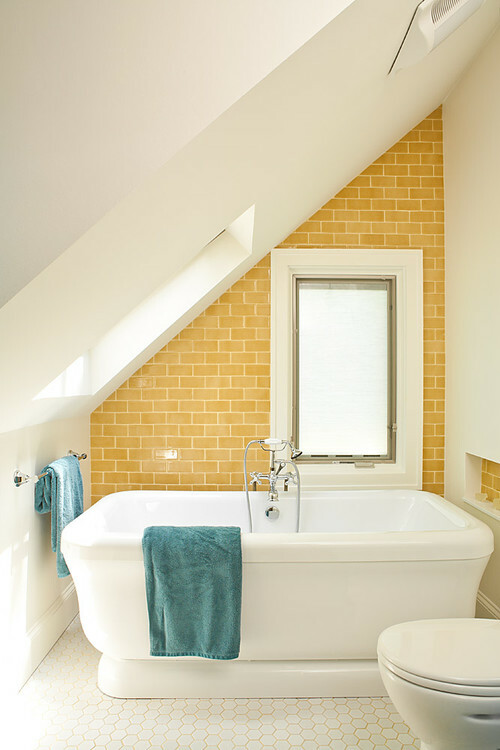 A key point to remember when refreshing your bathroom is that less is more. 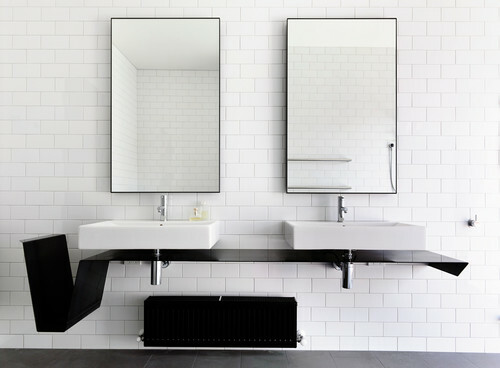 The simple pair of thin, black-framed wall mirrors in this Melbourne bathroom exude sophistication and style to the highest degree. 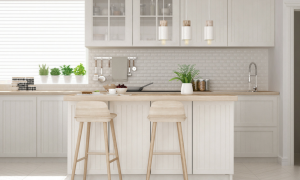 Subway tile is one of the more cost-effective tile options, but it doesn’t have to be traditionally bright-white and straight-lined. Colored tile has a rightfully earned spot in home design, as seen in this Atlanta bathroom. The perky yellow hue keeps summer going all year long. 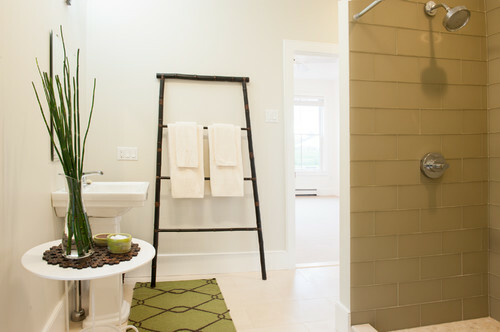 Take another budget-friendly cue here by only outfitting one wall with tile to draw in the eye and enhance the effect. This simple trick will cost you nothing more than a quick trip to your local hardware store for a bucket of your favorite paint color and a paintbrush. Create a statement-making accent wall by lathering up a wall or two in a beautiful hue. 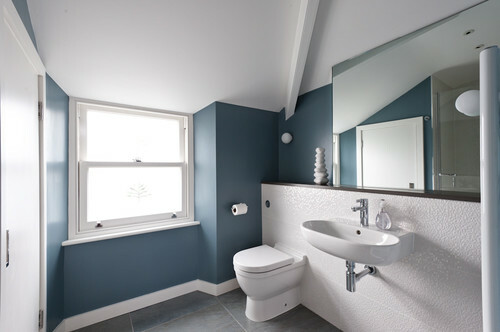 The deep sea blue seen here promotes a peaceful vibe in an otherwise ordinary, stark-white bathroom. If you’re blessed with a green thumb, this one is for you. Pair local garden favorites with stylish new vases and watch them breath new life into any dark or dreary space. 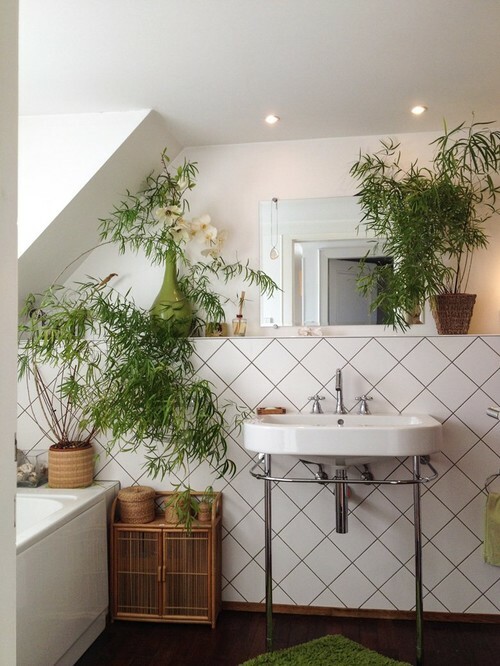 Houseplants not only keep you healthy by purifying the air, but they also effortlessly complement any style. Start with a snake plant, also known as mother-in-law’s tongue, which requires low light and watering every couple of weeks. At a cost of $5 or less per cabinet pull, you can’t get much cheaper than this. 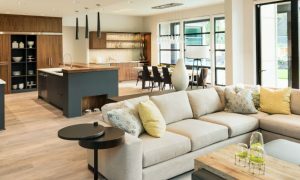 Although they’re small, your choice of hardware can make a huge difference in a room’s design. 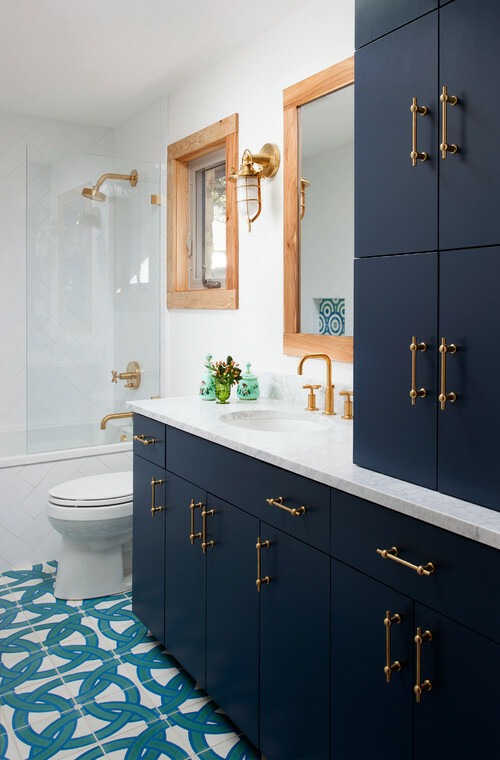 Gold and silver are classic options for any bathroom, but brass has also made a comeback. 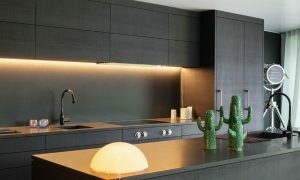 Keep in mind the contrast between the cabinet color and the metal finish whenever possible; the stronger the better. If you have a spare ladder in your garage, you don’t need to spend a penny for this trick. Prop it up against a bare bathroom wall and hang fresh towels on it for rustic charm and a designer showroom look. It’ll save you money on towel holders, hooks and shelves and will give you a new stylish solution for all your bath linens. Even the fanciest bathroom will look like a mess if it’s not well taken care of. After investing in these small changes to glam up your bathroom, make them count by doing daily or weekly maintenance. 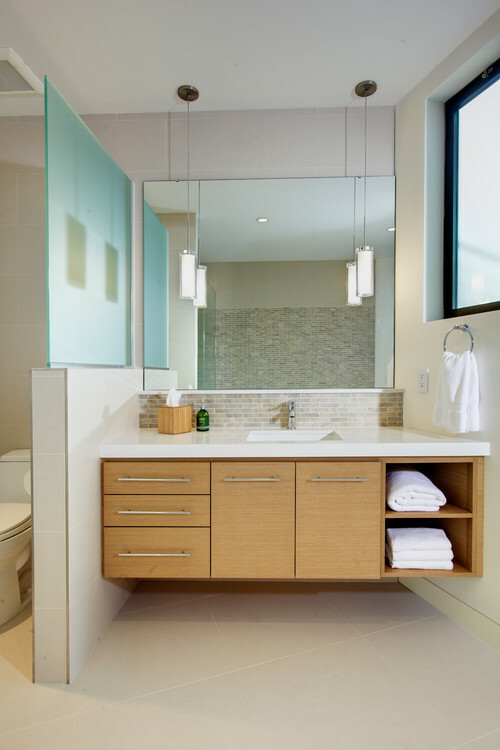 Set a timer for 20 minutes to wipe down surfaces and clear clutter to truly enjoy your beautiful new bathroom.